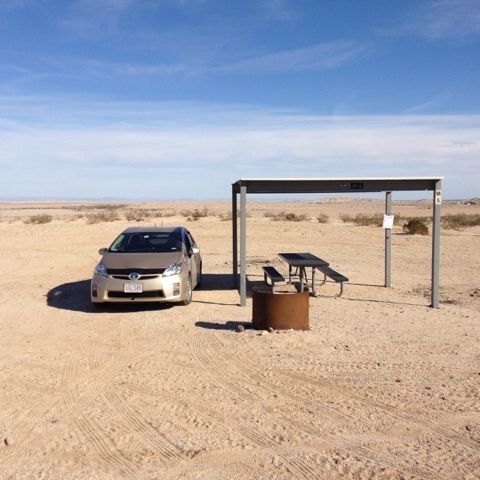 I moved Thursday to Ocotillo Wells Recreation Area to the west of the Salton Sea after three nights in Slab City. I ended up spending Thursday and Friday nights. 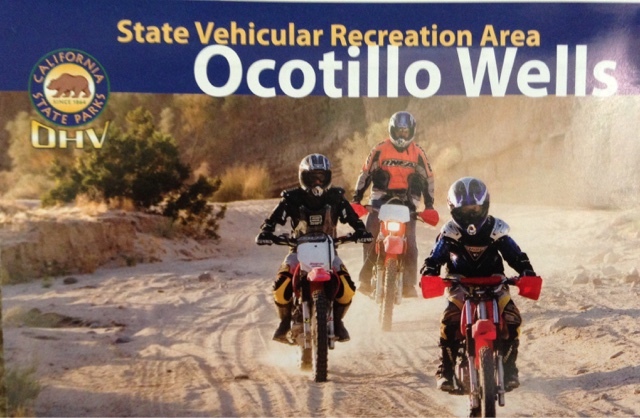 Ocotillo Wells is for of road recreation vehicles. 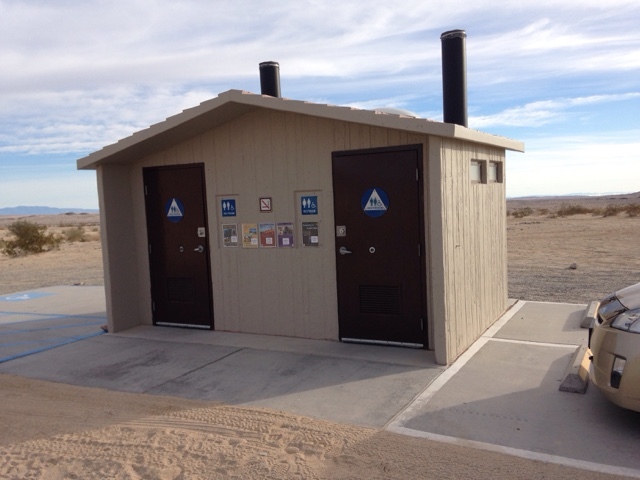 The 84,000 acres that comprise the recreation area are open for disbursed camping and there are a number of camp sites with pit toilets. At the information center and about one mile east there are coin showers by the quarter. $1.00 for 8 minutes and 6 minutes for $.75 and so on. This is a picture of the map of the area. The lower edge is CA78. 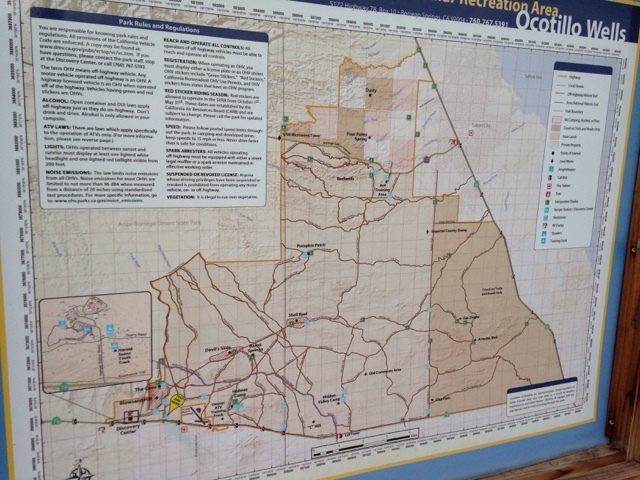 The lower left corner of the map is where I stayed one mile east of the visitor center. Thursday night was quiet and I was at this ramada and the other 3 around me were vacant. 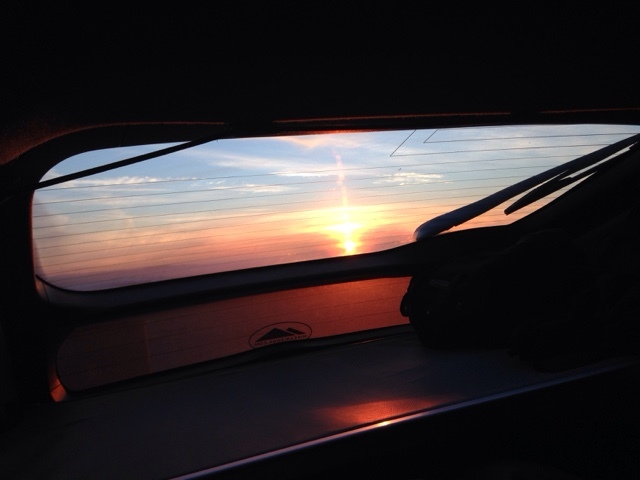 My first morning view out my rear Prius window from bed. 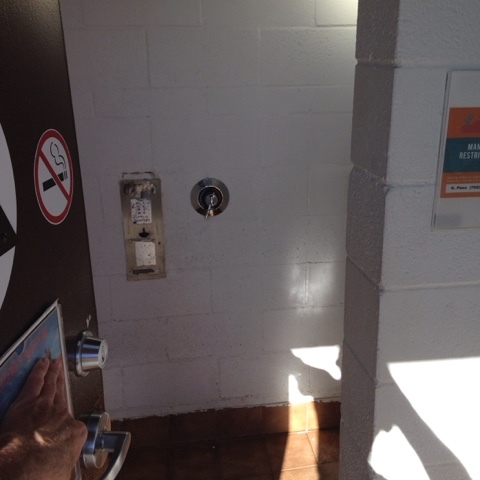 These are the showers at the visitor center. 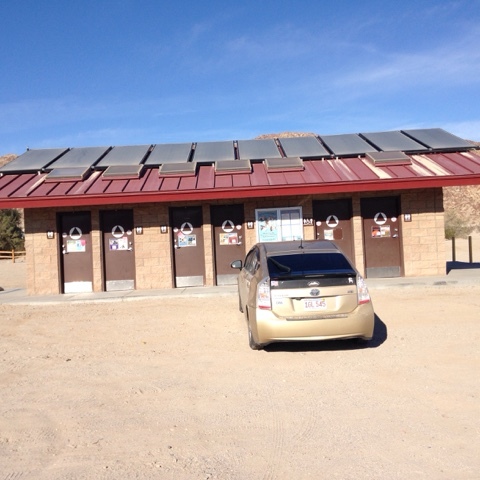 All showers are heated via the solar panels on the roof. In the AM you risk not having hot water, although no sigh about this. A ranger told me when I asked about them. I did take a shower Saturday morning at 6:00 before leaving and there was hot water for me. 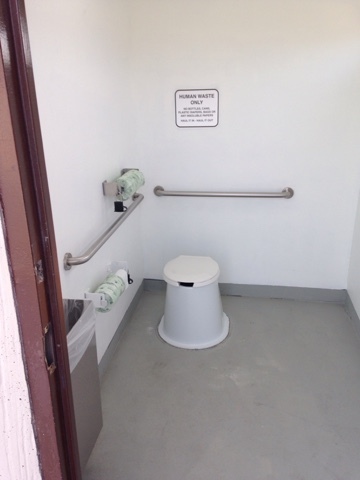 This is what the pit toilets are like and they were great to. They were well maintained too and no smell. Friday I went to check out Borrego Springs, Anza-Borrego Spribgs State Park and drove to Julian, CA for Pie. 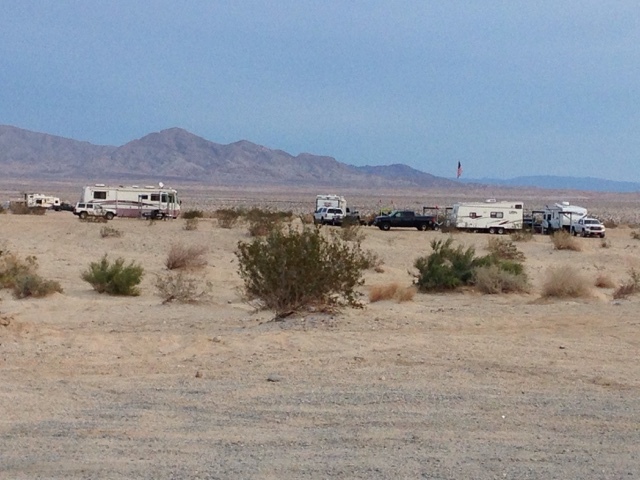 I returned to Ocotillo Springs for the night and the weekend crowd had arrived. I went to the only vacant ramada in the same area. There were 4-wheelers riding in and out to the vast expanses. I went to bed and then at midnight the guy next to me decided to start up his 4-wheeler near me and revved the engine at midnight waking me up. He then went to the guy across the street and he also started his up and then they went up and down the park road. 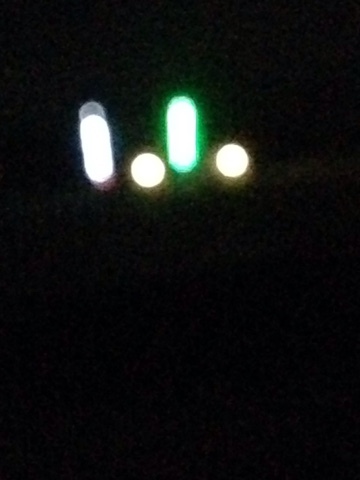 They have lighted antennas as seen in the night picture above. They left for the great expanses. I slid over the seats to the drivers and drove up the park road to an area free of such noise at such hours. Well, I thought. Afte a half hour at this new spot two large trailers and associated 4-wheelers came in at 12:30 am and parked near me and started their equipment. Again I articulate my body to the drivers seat so I don't have to get dressed and moved again closer to the main highway. After my emotions settled down I finally got back to sleep. I liked this place for location and services at no cost to stay, but I need to do a better job of picking a spot without such rude nighttime behavior. I wasn't the only one that was there without ATV. I was parked over there and then surrounded. 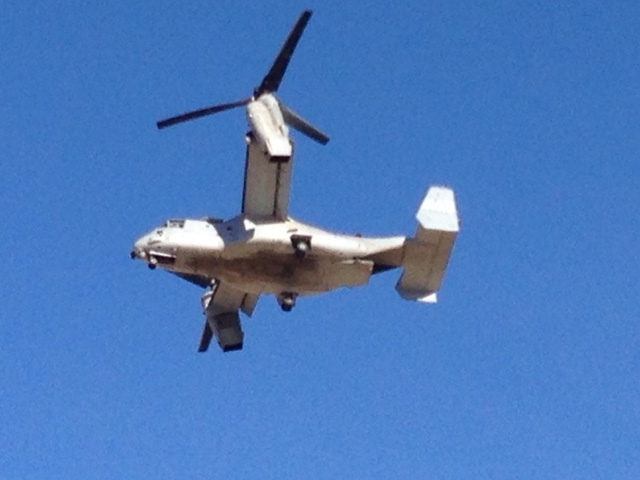 On Thursday evening this Osprey, I think from the Marine Air Station in the San Diego area was over the Ocotillo Wells camping area practicing desert landing and takeoffs. They flew directly over my campsite. 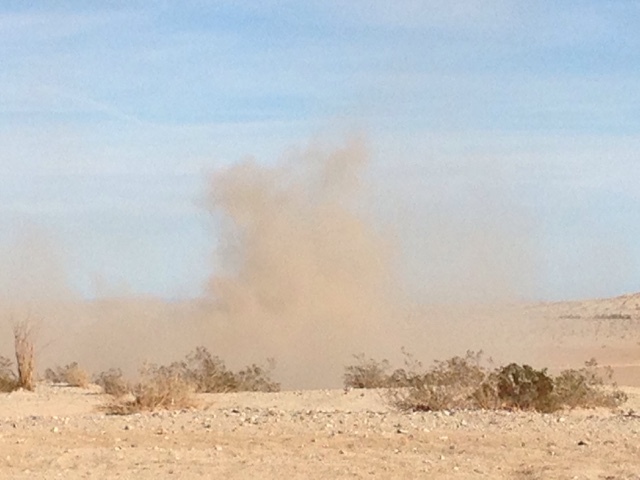 When they land the Osprey they create this dust bowl. The dust did not drift my way. 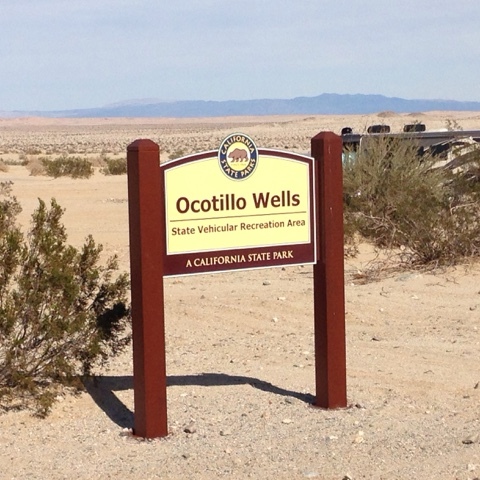 The Ocotillo Wells campground has excellent services and it's free to stay. You just need to bring your own water, but I carry 6 gallons in my Prius fresh water tank I installed. Jus plan on weekend crowds with their toys and camp where you are a bit away. With 84,000 acres it's not hard to find a spot.